This is a mixed ride within the San Francisco city limits of a very rare breed. The ride puts together a surprising combination of narrow and (sometimes) technical singletrack trails, family-grade multi-use park paths, and a healthy dose of first-class views. There aren't many ride routes within the city that could qualify as a genuine mountain-bike ride. This ride and the route listed on this site as the "San Francisco Peaks" ride are the only ones that I would say have any shot at qualifying for that designation. The main motivation behind the overall route is the use of the trails in John McLaren Park. McLaren is San Francisco's second largest park after Golden Gate Park. It contains a surprising amount of honest-to-goodness singletrack trails that allow bikes. Still, the trail mileage doesn't add up to a whole lot. Because of that, any McLaren Park trail ride substantial enough to satisfy will either need to do a lot of weaving back and forth while also repeating at least some of the trail segments, or it will need to connect to some additional trail mileage outside the park's boundaries. For this ride, I've opted for the latter. 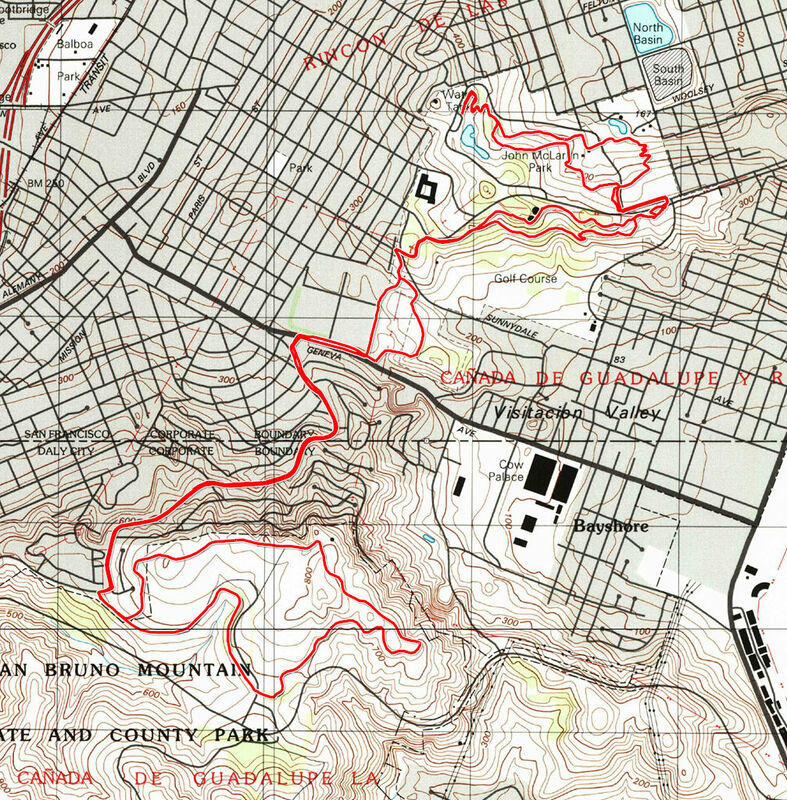 The route connects to some trails in San Bruno Mountain State Park via a 1.5-mile road segment. More important than the mileage on city streets, though, is the fact that this road segment happens to be the ride's only sustained climb, and a fairly significant one. You gain nearly 450 feet of net elevation over those 1.5 miles on the way up. At its worst, the slope reaches 14% for a brief period, although it doesn't range above 8% for all the rest of the climb. It feels like real work, but it's not that hard to grind your way up slowly with the low gearing of a mountain bike. To start the ride, I chose a parking lot of the park on the corner of Mansell Street and Visitacion Avenue. This free lot is labeled as "Vista Parking Lot" on some maps and the "Wilde Overlook Parking" on one map that I encountered. It's not a very large lot, with space for only about 20 cars. If you can't find any space available there, I would try a larger parking lot of the park on John F. Shelley Drive near the northwestern corner of the park. The park has a couple more small parking lots near McNab Lake. I would try all of these lots before beginning to look for street parking in the surrounding neighborhoods. On the other hand, for the thousands of riders who live in San Francisco, this is a ride that can be done straight out the door with the addition of a few more miles of street riding, as long as you don't mind pedaling in city traffic. However, since the ride takes place mostly on hilltop areas, it's worth remembering that pedaling your way here will significantly boost the total climbing involved in your ride. The trails within McLaren Park itself are a little disorganized. Most trails aren't named, very few trails are signed, and the distinction between sanctioned and unsanctioned trails is very blurry. On the positive side, I know of no trails in the park that disallow bikes. However, if you'll be riding here for the first time without the company of someone who knows their way around, it will require a good amount of improvization. The park is not that huge, so there's little reason to worry about getting lost. In most cases, you can try an option that you're faced with, and simply retrace your steps for a few minutes to get back where you were before in case it doesn't work out. For similar reasons, you'll find that I haven't tried to include a photo of every single junction in the images for this ride like I do for most other listings on this site. This is because the junctions keep coming way too quickly. The photos are, therefore, meant as merely a sampling of the imagery from different parts of the park, rather than as a set of visual directions that can be followed. I'm not a regular rider of these trails, but I did try to do my homework carefully before planning the route you see here. I tried to stick as closely as I can to the course of the short track race of the San Francisco Mountain Bike Festival that was held here for a few years, while maintaining variety and limiting trail repetition. I also tried to stick to the trails that appear most likely to be the legitimate ones. What you see here is not necessarily the definitive mountain biking route through McLaren Park. I don't believe there is any such definitive route. The trail network is compact and dense. Most local riders will have settled on their own favorite route through the park after numerous rounds of trial and error. The route I show on this page can't be much more than a rough guideline to follow for someone who'll be trying the park for the very first time. The character of the trails in McLaren Park ranges across a very wide spectrum. There are numerous paved trails that are often wheelchair accessible. There are some smooth dirt paths that are not quite as wide as a typical fire road. There is a surprising amount of narrow, twisty singletrack with minor techy features here and there. There's even one half of a boulevard (Mansell Street) that's been closed to motor-vehicle traffic and turned into a park path. And there are some bridges and staircases sprinkled throughout. This being quite a hilly area, there is no shortage of ups and downs whenever you are trying to get from one point to another, and the climbs can frequently be steep. However, they never last long (with the exception of the climb on the ride's road segment). Some of the singletrack is actually of fairly advanced level. There are some stretches where the trail gets very narrow and can be off camber in certain spots. This is especially true in the park's southern half (south of Mansell Street). In that part of the park, the two major singletrack routes actually feel like they were built with mountain bikers at least partially in mind, with tight turns made around trees and some humps on the trail that seem to serve no purpose other than enabling the pumping of the trail. To get from McLaren Park to San Bruno Mountain, the ride uses a few more trails segments in the southern extreme of the McLaren Park lands, near the Crocker Amazon playground and soccer field. I took two different paths through this area on the way to San Bruno Mountain and on the way back. My only reason to use a variation on the way back was to reduce the wasted climbing, but it did mean carrying my bike up a staircase. So, if you don't mind one more climb, you can simply follow the same (or similar) route through here on the way back too, going over the little hill there one more time. When you hit San Francisco streets with car traffic on your way to the sub-loop of the ride on San Bruno Mountain, you might expect that there will be little of interest along the way. The surprising thing is that even this leg of the route has its own kind of charm. Most of the streets you'll ride through are residential, and the modest homes in this area are of the same scale and seem to share a similar style, for the most part. However, almost no two are identical and many are painted in a wide variety of cheerful, pastel colors, lending the neighborhood a distinctive and upbeat look. It's fairly clear that most of the neighborhood has been built as a single housing development, but that doesn't take much away from its appeal, in my opinion. The loop on San Bruno Mountain is the polar opposite of the McLaren Park portion of this ride in terms of trail character. This loop is so smooth, even, and gently sloped that it seems the whole thing could be traversed without much trouble even by a preschooler on a tricycle. If you look at this portion of the route on the elevation profile, you may notice that doing the loop counter-clockwise as I have done results in a long and very gentle climb and a relatively steeper descent. Done in this direction, roughly the first third of the loop is on a paved trail before you get onto the smooth fire roads. I'm not necessarily convinced that this is the better way of traversing this loop. If you're okay with a somewhat steeper climb for a shorter distance, it might be more pleasant to then find yourself descending gently toward the bay with views in front of you. The choice is yours. This is a non-challenging loop regardless of direction. Without a doubt, the stand-out feature of this sub-loop are the views. You catch a variety of long views toward various parts of San Francisco, all of them from the northern half of the loop. This is the most scenic part of the entire route, hands down. When talking about McLaren Park (or about these parts of San Francisco in general), one thing worth touching upon is crime and safety. There was a time when people advised each other not to enter this park alone. Those days appear to be left in the past. If you look at a crime map, you'll see that this area actually shows a noticeably lower density of incidents than many other parts of the city. The neighborhoods in which the ride takes place are still some of the lowest rated in the city in terms of income and quality of life, but there's little reason to be skittish about an occasional visit, at least not more than you would in any major US urban center. Simply follow the same common-sensical precautions you would anywhere: if you'll be coming by car, make sure you leave nothing visible inside your vehicle; valuable or not.